Moncks Corner Pro Rodeo – Hope Acres Rescue has been invited to participate again this year at the Moncks Corner Pro Rodeo! We will be assisting with parking and have a table of information and merchandise! Please stop by and say hi while you enjoy the Rodeo! First Friday with DJ NattyHeavy – Celebrate your Friday with DJ NattyHeavy at The Brick! Voted as The 2018 Best Club DJ by The Charleston City Paper. You also have a chance to win a free tab from DJ NattyHeavy. When: September 27th – October 7th. Isle of Palms Connector Run – Non-profit 5K and 10K race for the healing and prevention of child abuse in Charleston. Racers will begin at the designated point on Palm Blvd. They will then follow along Palm Blvd and turn left onto the Isle of Palms Connector at the light and over the intra-coastal waterway. Bird Fest 2018 – This festival is a celebration of our feathered friends! Festival will include organizations such as Birds of Prey, Ducks Unlimited, South Carolina Waterfowl Association and many more. Tailrace Tavern Food Truck and Live Entertainment by the Charleston Hot Shots, a guided bird walk by Audubon, a flight demonstration by Birds of Prey, and a photography class by Eric Horan. Charleston Cider Crawl – Love cider? Yeah, we do too!! !…so we have put together a cider crawl featuring the best restaurants, bars and bottle shops in Charleston. Cider, Cider Cocktails & Food Pairings. Check out the posts on the page as venues and specifics get added. 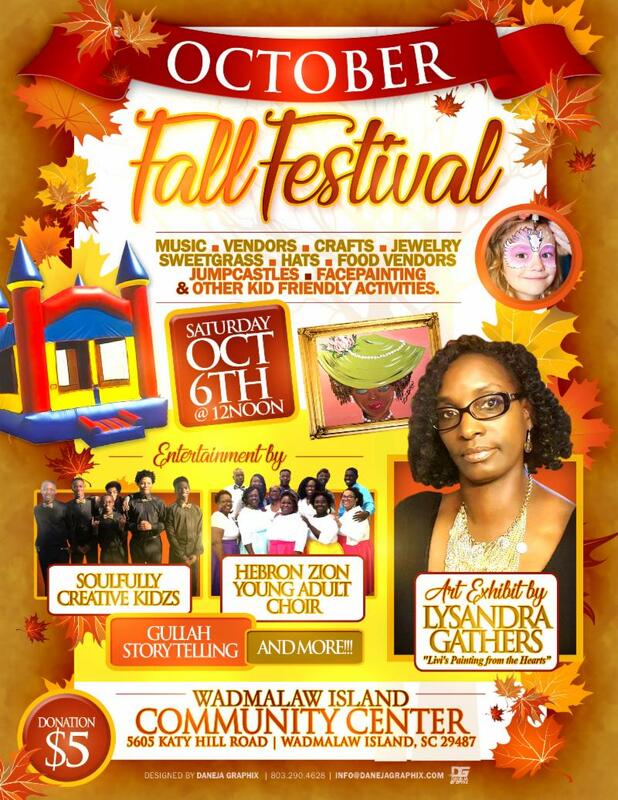 October Fall Festival on Wadmalaw – $5 donation. Music, vendors, crafts, jewelry, sweetgrass, hats, food, jump castles, face painting and other kid-friendly activities. Art exhibit by Lysandra Gathers, Gullah storytelling and more. Oktoberfest @ Baystreet Biergarten – The fun starts at noon as DJ United (12-3) sets the musical backdrop for you as you test your strength on our High Striker carnival game (think giant sledge hammer slamming) and skills on the quarterback challenge or hoop zone. When: Saturday, 12p.m. – 11 p.m.
Revel on The River: Film Screening/Happy Hour – This unique event is centered around The Bend on the Ashley River and features music, fly fishing instruction, birding, paddling, cleanups, educational programs, a film, history, food, and beers from Charleston’s finest breweries. Jump, Little Children Album Release Party – A new Jump, Little Children album will drop and the band will also launch a multi-city tour throughout the Southeast, major cities of the Northeast, and Chicago this Fall. Special guests include Sondorblue. When: Sunday, 9 a.m. – 6 p.m.
Charleston Oktoberfest – This year’s Oktoberfest will feature a wide variety of seasonal beers, live German music, German dancers, great german food from several local vendors, a kids zone, and more! Tickets are $10 in advance and $15 at the gates.